Italian marble is a superior quality marble. It is the best in terms of quality. Nothing compares to the unique characteristics that are exhibited by Italian marble. You can add a touch of style and luxury into your custom built home in new york using the Romano waterjet cut round marble medallion. 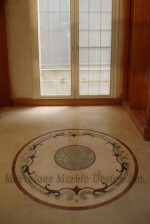 This medallion not only offers you with the best marble in the world but also delivers a lovely and amazing point of interest. 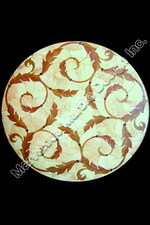 Romano waterjet cut round marble medallion is exactly as the name suggests, it is round in shape. The shape is a perfect circle with no irregular curves. This shape makes the medallion appear large than it actually is. The optical illusion provided by the medallion works very well in helping make a somewhat small room appear large than it is. This is the kind of floor medallion that you should consider getting for any of the unfortunately small rooms in your home. You can also get the medallion installed in a large room. Romano’s design is intricately crafted by hand with a few touches completed using water jet cut machine. The medallion’s finer details are all done by hand. The details cannot only be achieved by hand. Not a single machine in the market today can achieve these fine details. The details are true works of great craftsmanship. This spectacular piece of fine art includes a charming blend of colors. The colors are interpolated in a way that ensures each colored pattern compliments the next colorful pattern in the design. 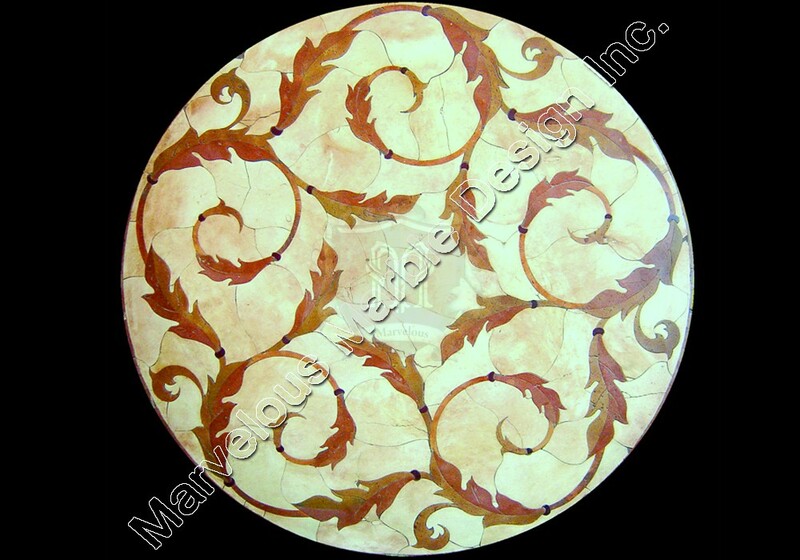 Spanish cream marfil is one of the glowing colors that are featured in the design.you can include some lighting under the medallion for a more glorious finish if you make the onyx backgound with an extraordinary glow. Other colors that are part and parcel of the design include Indus gold which closely resembles the color associated with Pakistan Indus Gold Marble. The lovely floral patterns in Indus gold look like what is often referred to as the Chinese dragon. The pattern runs round the entire piece to form a border like pattern. Romano waterjet cut round marble medallion is finely polished. 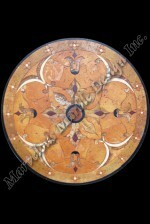 This floor medallion comes in various sizes including 36”, 48”, 60” and 72”. In addition to these sizes, a custom size that best addresses your luxurious home’s needs can be provided. The colors can also be changed so that you get a piece that is truly a reflection of you.